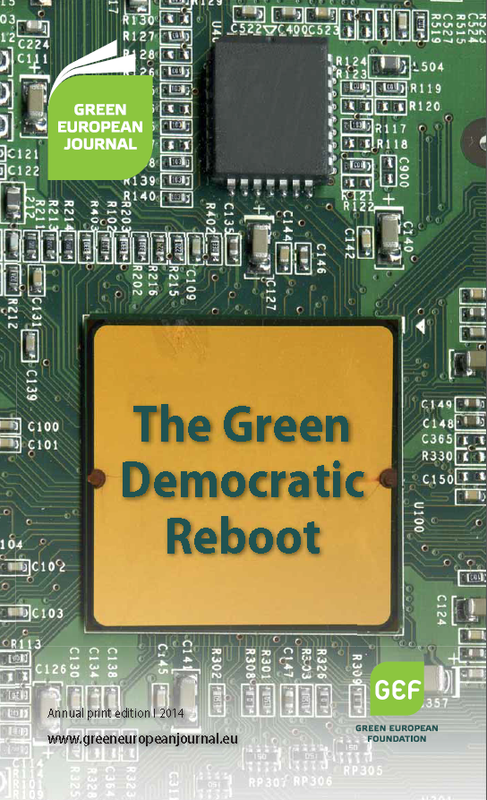 The second print edition of the Green European Journal has a special focus on democracy and what it means for Greens – both as an ideal in the political imaginary and as an organising principle in the day-to-day workings of parties, foundations and informal civil society groups. The articles in this edition fall into three main categories: a discussion on democratic principles; the role of Green foundations; and various democratic initiatives and experiments. In recent years, the volume of articles and books dedicated to the democratic crisis has been constantly expanding. The same is true of the literature addressing the ecological crisis. Yet a simultaneous reflection both on the ecological and on the democratic crisis has not accompanied this proliferation. Old Europe is disaggregating. The new Europe, which has long been a reality in the mind of many European citizens, is waiting for its constitution, one that will effectively take us into the future. The economic crisis and the democracy crisis share some of the same causes: redefining the ideal of democracy, the impotence of current regulatory methods in the face of collective decision-making, and a crisis within political programmes. Before investing excessive hope in radical participatory solutions we need to re-examine established beliefs about democracy and sustainability and their mutual relationship. Are political parties still capable of integrating the long term into their strategic reflections? The coming upheaval in our ways of living and working will require us to live an ecological lifestyle based on new forms of democratic participation that enable us to collectively and comprehensively reshape our social and physical environment. The European Elections, held in tandem with local elections, proved to be a turning point for the Irish Greens. It was a real comeback at local level, particularly in Dublin, and came desperately close to electing an MEP. Green Foundation Ireland (GFI) has played a real part in this recovery. Given the current political climate, it behoves ecologists to thrust imagination, innovation and experimentation to the forefront of political action and thought. This requires a “benevolent distance” between the Green foundations and the Green parties. An interview with Ralf Fücks, Director of the Heinrich Böll Foundation. Democracy in Sweden: Firmly Rooted? While seeming solid, democracy in Sweden faces serious challenges, such as the rise of populism and voter disengagement. In this context, green foundations are well-placed to propose new initiatives that may help re-engage citizens in the political process, notably through structural changes. The Green European Foundation aims to provide a platform for Green foundations to interact and collaborate at a European level. The EU Fifth Project is creating a network of community-based movements as part of a broader transition, starting at the local level and gaining international momentum, with the aim of building a sustainable future. In an unprecedented step towards direct democracy, Finland adopted a national Citizens’ Initiative law in March 2012. Although it has succeeded in opening debates in the national parliament on a number of issues, serious questions remain over whether citizens really have the power to effect change through the tool. Agora Voting is an innovative project using free software to establish social citizen networks for the development of a system for secure electronic voting. Spanish Green party Equo collaborated on this project to carry out Spain’s first real experiment with direct democracy. Do we really want more Europe, integration and solidarity? Or should we perhaps first ask exactly what ‘more Europe, integration and solidarity’ should look like? The results of the European elections in Poland show that ‘old federalism’ is retreating. The European Citizens’ Initiative opened a much needed channel for citizens to reach the European Institutions directly, and brought with it immense potential to reinforce the EU’s democratic legitimacy.